California was perhaps the most important locus for the development of the Progressive reform movement in the decades of the twentieth century. These twelve original essays represent the best of the new scholarship on California Progressivism. Ranging across a spectrum that embraces ethnicity, gender, class, and varying ideological stances, the authors demonstrate that reform in California was a far broader, more complicated phenomenon than we have previously understood. 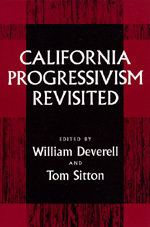 Since the 1950s, scholars have used California Progressivism as a model case study for explaining early twentieth-century social and political reform nationwide. But such a model—which ignored issues of class, race, and gender—simplified a political movement that was, in fact, quite complex. In revising the monolithic interpretation of reform and reformers, this volume provides a better understanding of the sweeping reform impulses that had such a profound effect on American political and social institutions during this century. Equally important, the issues examined here offer significant insights into problems that the entire country must tackle as we approach the new century. William Deverell is Professor of History at the University of Southern California and Director of the Huntington-USC Institute on California and the West. He is the author of Railroad Crossing: Californians and the Railroad, 1850-1910 (California, 1994) and coeditor of Metropolis in the Making: Los Angeles in the 1920s (California, 2001). Tom Sitton is Associate Curator of History, Los Angeles County Museum of Natural History, and the author of John Randolph Haynes: California Progressive (1992).